A senior scientist who said physics “was invented and built by men” has been suspended with immediate effect from working with the European nuclear research centre Cern. He said, in comments first reported by the BBC’s Pallab Ghosh, that physics was “becoming sexist against men”. Last month, Prof Jocelyn Bell Burnell told the BBC she believed that unconscious bias against women prevented them from getting jobs in physics research. And a major study published in 2012 in the US scientific journal PNAS showed that science faculty members rated identical job applications more highly when presented to them with a male name rather than a female name. Scientists reacted to Prof Strumia’s presentation on social media, complaining about discrimination they had suffered in the course of their work. Cern – which currently has its first ever woman director-general – said in an earlier statement the organisers were not aware of the content of the talk prior to the workshop. 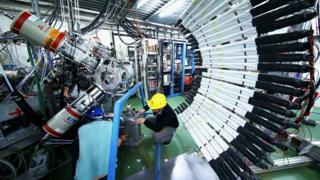 A Cern spokesman confirmed that there was a video recording of the presentation. Senior managers would decide whether to release part or all of it, it said. In 2015, Nobel laureate Prof Tim Hunt resigned from his position at University College London after telling an audience of young female scientists at a conference in South Korea that the “trouble with girls” in labs was that “when you criticise them, they cry”.